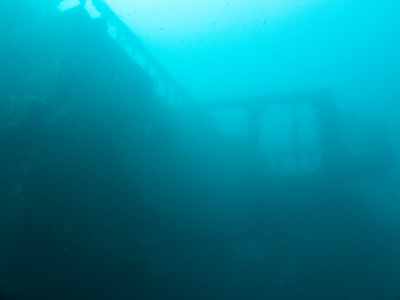 Michael McFadyen's Scuba Diving - Coolooli One of the largest vessels scuttled on the Long Reef Wreck Site is the bucket dredge Coolooli. Built in 1955 at the NSW Government State Dockyard at Newcastle (NSW), the Coolooli was unpowered. She displaced 150 tonnes and was 50 metres long and 10 or 11 metres wide. The dredge was owned by the NSW Maritime Services Board and used to keep NSW ports navigable. 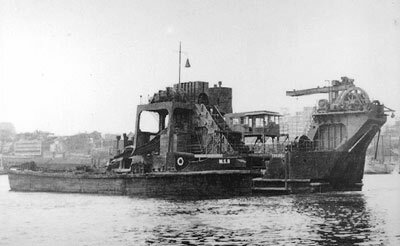 I have read that she dug out Darling Harbour, not sure which part this may have been, but as there have been ships using Darling Harbour for over 100 years, may be it was deepening it. Sometime before 1975, it was laid up. On 19 August 1980 (one record says 29 August), the Coolooli was sunk as part of the reef and now lies on its starboard side on sand in 48 metres of water. After heading out of Sydney Harbour (or Broken Bay) travel until you are off Narrabeen Beach to GPS Reading 33° 43' 11"S 151° 20' 53"E (note that all my GPS Readings are using AUS66 - if you use any other datum, you will need to convert the reading - see my GPS Page for more details). Line up the water tower to the west with the right hand side of the northern block of units on Collaroy Beach and in the middle of the third block behind the beach. The north-west mark is the Bahai Temple at Ingleside above the second set of Norfolk Island pines from the northern end of North Narrabeen Beach. After running out to sea past the north-west mark, slowly head towards the Bahai Temple until the two marks line up. The depth on your depth sounder will come up from 48 metres to less than 40. Immediately turn to the north and drop anchor while still over the wreck. If the anchor misses the wreck and hits the sand to the north of the wreck, the anchor will not take hold as the hull lies along the north and eastern side and the anchor will just slip past the wreck in a north-easterly sea breeze. 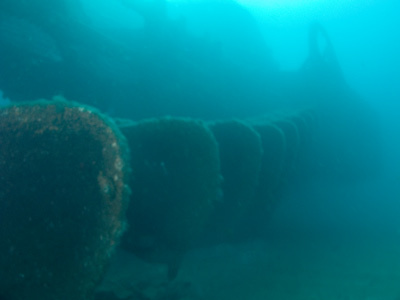 The wreck lies in a north-south direction. After descending to the wreck, check the anchor as sometimes it can fall into a very hard position from which to later remove it (I have seen an anchor go through two hatches right to the bottom of the wreck). 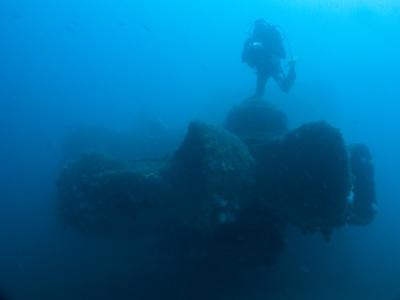 On your first dive here it will generally be possible to only examine the wreck from the outside as a leisurely swim around the wreck will take at least 15 minutes with only short stops at parts of the wreck. 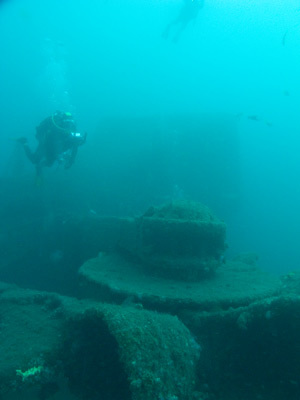 You should follow the wreck to the north (on the western side of course) where you will see the superstructure. 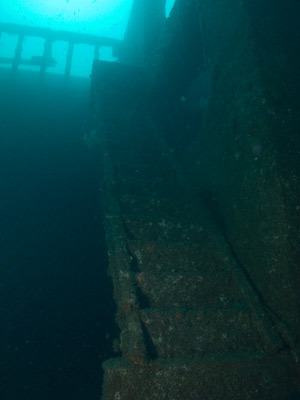 You can easily penetrate this part of the wreck safely as it is very open. You can even enter the funnel and come out through a hole in its side. After you reach the stern, head back to the south on the outside and follow the buckets right to the bow. This is the tip of the "cutter bar" (if you think of it as a chainsaw). You can follow the buckets back through the opening where they come before they hit the sea bed when it was operating. From here you can go through the wreck back to where you started. As indicated, the maximum depth is about 48 metres, but a dive probably averages 44 to 46 metres. Before completing the dive, remove the anchor from the wreck and drop it on the sand. However, be aware of the barge about 20 metres to the south and there is also another series of barges about 200 metres (perhaps less) to the south. 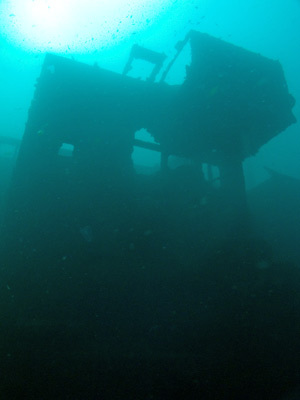 On subsequent dives here, you can examine in more detail small sections of the wreck including the bucket arm, the bridge and the upper deck areas as well as inside. I have only encountered current on the Coolooli once but this was only on the surface (you should check for one after anchoring). The visibility is usually good and all my dives here have averaged 12 to 15 metres. Of course, its depth means that this is not a dive for the inexperienced or even an experienced diver without deep diver training. On 20 March 1994, a tragic incident occurred on the Coolooli when noted a friend of mine, Sydney diver, Paul Cavanagh (then Manager of Sydney's Channel 7 TV Station), died while undertaking a dive (a complicated story, but he suffered an oxygen toxity attack as a result of using equipment that was poorly thought out and designed - he subsequently drowned). There are two plaques to Paul's memory deep inside the funnel. The fishlife on this wreck is very disappointing, with so few fish compared to the SS Tuggerah and SS Undola, although in May 2003 we had heaps of fish. You get a few red morwong, sergeant baker and trevally but that is about it. I have seen some huge jewfish on the wreck. One thing worth examining are the jewel anemones that totally cover some ropes or wires below the middle of the vessel and also in the bucket dedge slit. The pinks and blues really liven up the wreck. Despite the lack of fish, the Coolooli is a great dive site, worth visiting many times. NOTE: The Coolooli collapsed a fair bit after the huge seas of the few weeks before 5 June 2009. I have dived the wreck only once since then, but it was still a very good dive. Some parts of the wreck were still intact, but other parts had collapsed on themselves. Needless to say, it is no longer the intact wreck that it was till this date.